The Dragonfly TLSO™ is a code-verified truncal orthotic system which combines a warm-and-form spinal bracing with the wearable therapy of a TheraTogs subsystem in a customized, integrated orthosis. "The Dragonfly combines two proven clinical approaches," said Beverly Cusick, PT, MS, NDT, COF, TheraTogs inventor and Chief Medical Officer of the company. "The clinician wraps the client's hips and torso in a cozy, breathable undergarment system that delivers somatosensory input, flexible stability, and attachment sites for muscle-assist strapping. The Dragonfly then supports the spine with a lightweight but rigid panel, custom-formed to the iliac crests and upper trunk, to anchor spinal alignment support on the pelvis." The Dragonfly also allows the clinician to custom-form a spinal support anchored on the pelvis to promote superior torso stability throughout the core; provide abdominal support and intracavitary pressure without restricting respiration or requiring a complicated tightening device; and facilitate long-term neuromotor improvements that address the cause of postural and spinal issues – with a live-in orthotic solution that does more than simply immobilize the spine. The patient benefits from its light weight – most adult-sized models weigh one pound or less, while pediatric sizes weigh a few ounces. 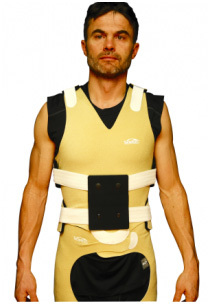 Plus, the patient can wear his/her customized postural support discreetly, under loose clothing. Pfeifer M, Kohlwey L, Begerow B, Minne HW. 2011. Effects of two newly developed spinal orthoses on trunk muscle strength, posture, and quality-of-life in women with postmenopausal osteoporosis: a randomized trial. Am J Phys Med Rehabil. 90(10):805-15. Conclusion: The use of an orthosis increases trunk muscle strength and therefore improves posture in patients with vertebral fractures caused by osteoporosis. In addition, a better quality-of-life is achieved by pain reduction, decreased limitations of daily living, and improved well-being. Thereby, the use of an orthosis may represent an efficacious nonpharmacologic treatment option for spinal osteoporosis. Pfeifer M, Begerow B, Minne HW. Effects of a new spinal orthosis on posture, trunk strength, and quality of life in women with postmenopausal osteoporosis: a randomized trial. Am J Phys Med Rehabil. 2004 Mar; 83(3):177-86. Conclusion: The use of an orthosis increases trunk muscle strength and thus improves posture in patients with vertebral fractures caused by osteoporosis. In addition, a better quality of life is achieved by pain reduction, decreased limitations of daily living, and improved well-being. Therefore, the use of an orthosis may represent an efficacious nonpharmacologic treatment option for spinal osteoporosis. Ehab Mohamed Abd El-Kafy. (2014) The clinical impact of orthotic correction of lower limb rotational deformities in children with cerebral palsy: a randomized controlled trial. Clinical Rehabilitation 2014, Vol. 28(10) 1004-1014. Conclusion: Orthotic intervention composed of a static ground reaction ankle foot orthosis combined with the TheraTogs strapping system improves gait more than conventional treatment with or without TheraTogs in children with spastic diplegic cerebral palsy. Maguire et al. (2012) How to Improve walking, balance and social participation following stroke: a comparison of the long term effects of two walking aids- canes and an orthosis TheraTogs- on the recovery of gait following acute stroke. A study protocol for a multi-centre, single blind, randomized control trial. BMC Neurology 2012, 12:18. Fenneman, P, Ries, JD. (2010) Effects of TheraTogs on the Postural Stability and Motor Control of a 7-year-old Girl with Down Syndrome and Severe Motor Delays. Poster presented at APTA Combined Sections meeting, February 2010. Flanagan A, Krzalz J, Peer M, Johnson P, Urban M. (2009) Evaluation of Short-Term Intensive Orthotic Garment Use in Children Who Have Cerebral Palsy. Pediatric Physical Therapy 2009;21:201-204. Sefecka, A. (2009) Case Report: The AtaxiTog System As An Adjunct To Traditional Physical Therapy Intervention For A 13-Year-Old With Postural Instability Post Non-Traumatic Cerebellar Injury;A Five-Week Program. Poster presented at APTA Combined Sections meeting, February 2009. Rojas A., Weiss M., Elbaum L. (2008) The Effect of TheraTogs on the Gait of a Child with Cerebral Palsy: A Case Study. Florida International University Department of Physical Therapy, Miami FL. Poster presented at FIU Honors College Annual Research Conference, April 2008. Engelmeyer, Kelly SPT, et al. (2007) The Effect of TheraTogs on Gait in a 5-Year-Old with Spastic Hemiplegia. School of Physical Therapy, Maryville University, St. Louis, MO. Poster presented at APTA Combined Sections meeting, February 2007. 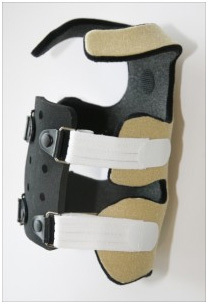 Burt, Marlenne G. (2007) A Strapping Case Study: Linking NDT with TheraTogs Strapping System and Other Orthotics. NDTA Network Publication, January February 2007. 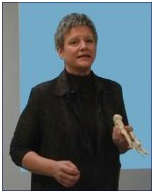 Beverly Cusick, PT, MS, BOC., founded TheraTogs, Inc. in 1997. She is an internationally known pediatric physical therapist whose specialty is the orthopedic and orthotic management of children with cerebral palsy and other neuromotor deficits. Now an Associate Professor for the Rocky Mountain University of Health Professions – Pediatrics Program – Provo, Utah (2006-present), she received her BS in PT from Bouve College at Northeastern University (Boston) in 1972, and her MS in Clinical and College Teaching for Allied Health Professionals from the University of Kentucky in Lexington (1988). She has guest-lectured at annual conferences of the APTA, the AOPA, the NDTA, and the American Academy of CP and Developmental Medicine; at the ISPO Consensus Conference for Orthotics in CP; for the British Association of Prosthetists and Orthotists; at the International Conference on Cerebral Palsy in Sydney, Australia. Ms. Cusick has conducted over 350 courses and guest presentations in the USA, Argentina, Australia, Brazil, Canada, Hong Kong, India, Ireland, Israel, and New Zealand. She's also toured Australia four times, twice as a guest instructor for the Australian Physiotherapy Association's Pediatric Special Interest Group. Her career includes being on staff at Children's Rehabilitation Center (now the Kluge Center) in Charlottesville, Va. She taught pediatrics-related courses as a member of the PT Education faculty of the College of Health Related Professions at MUSC in Charleston, S.C., and also initiated and directed PT services for the Division of Developmental Disabilities at the Medical University of South Carolina. She also consulted for Cardinal Hill Hospital's Head Trauma and Pediatrics teams, in Lexington, Ky., and the PT Department of Lucile Packard Children's Hospital at Stanford. Besides her current assistant professorship duties, she maintains a private practice, devoting most of her professional effort to generating literature and educational materials, to teaching, and to developing therapeutic products, including her invention, TheraTogs systems. State legislation is heavily contributing to the expected reimbursement/coverage uptick in 2016, as more states consider legislation requiring coverage for telemedicine and in-person visits alike. To date, 29 states and Washington D.C., have enacted legislation ensuring that private insurers offer reimbursement for telemedicine at equivalent levels with in-person services, provided the care is deemed medically necessary. Many of the laws enacted in 2015 will take effect in January 2016. Under telemedicine coverage and practice regulations, real time audio-video is considered the gold standard for telemedicine delivery. A close second, accepted across many states, is interactive audio with asynchronous data transmission of the patient's medical information. There are many situations where synchronous audio-video is neither feasible nor clinically necessary for appropriate medical action (e.g., teleradiology and telepathology both use asynchronous tech). Yet, even for synchronous audio-video, there remains variation among states regarding how, when and where these services are covered. For example, some states allow patients to conduct video consults from any location, whereas some mandate the patient be located at a qualifying originating site or a rural area. The trend, however, is to remove these artificial barriers and allow coverage of telemedicine consults regardless of the patient's location. Remote patient monitoring (RPM) is, by nature, a service without in-person equivalent. Therefore, very few states include RPM in their commercial insurance coverage laws, with some exceptions being Delaware and Mississippi. Similarly, fewer than two dozen states offer Medicaid FFS coverage of RPM services. Moving into 2016, as payers and providers recognize telemedicine's cost-savings benefits for patients with chronic illnesses and push for it, and as better home health care technologies proliferate, we are sure to see more legislation requiring coverage for RPM. One place to look will be states with older telehealth coverage laws, as providers in those states may push for an update to those laws to include RPM. Store and forward – the electronic transmission of medical information, including pre-recorded videos, images, and documents – is covered only by a minority of states because most have defined telemedicine as "occurring in real-time," or "using live video." Fewer than a dozen states expressly mandate coverage of store and forward telehealth in their commercial coverage laws. But in those states that do cover store and forward, insured patients can enjoy a powerful and convenient care benefit. Examples include Colorado, Connecticut, Hawaii, Montana and several more. Approximately the same number of states include coverage of store-and-forward in their Medicaid FFS program benefit. Another purported limitation on telemedicine expansion is state physician licensure requirements, meaning that physicians are not permitted to practice across state lines unless duly licensed. Whether state licensure truly is a material obstacle to telemedicine remains to be seen, as many providers have built (and are building) robust multi-state telehealth service offerings using professionals licensed in the states where the patients are located. That said, changes are on the way, as eleven states have already adopted the Federation of State Medical Boards (FSMB)'s Interstate Medical Licensure Compact with bills pending in nine more states, though its effective date is pending. Combined with revised federal Medicare rules, favorable state laws and board rules have the power to significantly grow telemedicine use and availability – something we expect will occur throughout 2016. Expanding state legislation is among five telemedicine trends driving health care transformation in 2016 and beyond. Next, we will cover retail clinics and employer onsite health centers on the rise. APTA's NEXT Conference & Exposition, Feb. 17-20, Anaheim Convention Center, Anaheim, California. ACPOC (Association of Children's Prosthetic-Orthotic Clinics) – Annual Conference, April 13-16. Please feel free to submit your questions on The Dragonfly TLSO™ as well as any other issue you would like addressed.